Flair & Paper is a stationery & gifts subscription box that is delivered monthly. 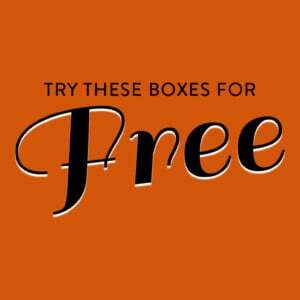 You can choose a 1, 3, 6 or 12-month subscription upon signing up and each box has a promised retail value of $40+. Each month, you will receive a collection of carefully-curated funny, sometimes snarky, greeting cards and stationery items which the designer describes as “brutally honest, yet insanely lovable!” and I couldn’t agree more! The Cost: $19.99 a month + free US shipping. Save with 3, 6, and 12-month subscriptions. COUPON: Use code WELCOME to save 50% off your first box of a 3, 6, and 12-month subscription! The box insert card described the meaning behind the theme and listed each item included in the box. Flair & Paper’s specialty item appears to be their original, sassy yet sweet greeting cards. This month’s box featured 5: 3 horizontal cards measuring 5 ½ inches wide by 4 ½ high and 2 vertical cards measuring 4 ½ inches wide by 5 ½ inches high. In my box, I received 3 horizontal cards. The first one is You Are So Loved. The card features an accent pink, self-seal A-style envelope. The card is blank inside for a personalized message to the right person. The second horizontal card I received is this awesome Adulting Is Hard. Let’s Be Unicorns Card. The card is featured with a brown A-style envelope and is blank inside. The online store does feature this card, but the accent envelope is a different color. The third and final horizontal card I received in my July box is this Thank You You’re The Best! Card. Like the others, it is featured with an A-style envelope and has a blank inside. I especially love this card because it can be written to anyone, at any time, just to remind them how much they are loved and appreciated. My July box also featured 2 vertical cards and this one was my absolute favorite out of all of them. My husband is there for everything; I can’t just walk into a grocery store and find the card that fits that to tell him how much I appreciate him! Uhm…Thanks For Putting Up With My Meltdowns is original, sassy and oh so perfect. The blank card is featured with a self-seal A-style envelope. The final greeting card in my July box is the birthday card featuring our llama! HBD You Gorgeous Animal is a horizontal card, blank on the inside for that special July-baby in your life! My box also included this Llama canvas bag, which can double over as a make-up bag as listed in Flair & Paper’s store. This bag is 10 inches long by 7 inches wide and has a black zipper. The bag is made of natural cotton canvas and is super roomy; the entire July box contents fit in it perfectly! The next item I received are these super cool magnetic bookmarks. I would consider these my personal favorite and WOW item. There are 4 different bookmarks with the print on the front and back. The entire bookmark is magnetic and is both light enough to mark a single page or strong enough hold a couple of pages. Flair & Paper included a set 6 pretty, pastel pencils with gold messages on them in my box this month. My favorite is Work Hard, Be Kind. Another favorite item in this month’s box are the sticky notes. I LOVE sticky notes and can never have too many. I received 8 different pads, 4 different shapes, all with 20 notes in each one. That’s 160 sticky notes!! I considered the August calendar insert a bonus item in my box. Its small enough to put in my canvas bag or purse and features July’s llama. Verdict: I loved this Flair & Paper box! The colors and designs of the pencils and sticky pads, the original greeting cards and accent envelopes and especially the magnetic bookmarks. The online store currently features greeting cards, canvas bags like the one in my box, mini bags, tote bags, and notepads. To get the stationery items, you should subscribe to the box. Not all of the items could be found online, but I totaled $34.50 for the greeting cards and make-up bag, which exceeds the $19.99 a month box cost, including free shipping. That means the other items need to average $1.16 to hit the $40 promised value. This box is well worth the monthly subscription price! Subscription Boxes are shipped the 4th of every month. Order by the end of each month to ensure you don’t miss out! Coupon – Use code WELCOME to save 50% off your first box of a 3, 6, and 12-month subscription! Value Breakdown: This box costs $19.99 + free shipping, which means that each of the 9 items in the box (not including the bonus calendar insert) has an average cost of $2.22. Check out more stationery and greeting card subscription boxes in the Paper Subscription Box List! What do you think about this month’s Flair & Paper box? Via email, I spoke to Heyar. You can get the July box if you request it, but she has to make substitutions for bookmarks, pencils, and sticky notes. Such a cute box and great review! Do you know if we would get this box if we ordered now? I know a little girl who loves llamas.